The details shown on this page are for our most popular tickets. There is a wide range of fares available to passengers joining or leaving our trains at the intermediate stations and halts not shown in the tables below. Our Booking Office staff will be pleased to advise further and can be contacted on 01766 516024 if you want information about specific fares. The choice is yours - travel all the way and back again, or ride trains and break your journey as much as you like on the date of issue. Porthmadog to/from Tan y Bwlch only. Blaenau Ff. to/from Tan y Bwlch only. 08.40 / 18.05 train only - Valid for 1x round trip to Blaenau Ff. One-way travel over the whole length of both railways from Blaenau Ff. to Caernarfon or vice-versa. All children under 3 travel FREE. All children 3 years and over require a ticket. One child under 16 years travels FREE with each adult or concession paying ordinary 3rd class fare. Additional children travel at half fare. A flate rate first class supplement applies. Concession fares are available to disabled customers and their carers. 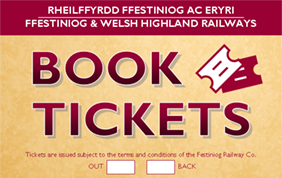 Travel in a Ffestiniog Railway Observation carriage for an additional charge of £8.00 each way per seat - or a Welsh Highland Railway Pullman carriage for a variable additional charge based on distance travelled, ranging from £8.00 to £12.00 per person for a single journey. Information regarding our first class carriages can be found here. 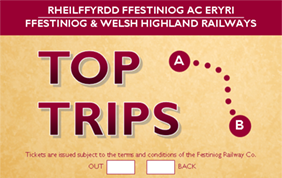 Subject to availability, First class seats may be booked and reserved at Porthmadog, Blaenau Ffestiniog or Caernarfon booking office right up to departure time. However, advanced telephone booking is strongly advised to obtain the seats of your choice as these carriages are very popular. To book and reserve your seats, please telephone our friendly booking office team on 01766 516024 who will help to organise your day. Carriages on some trains have extra wide doors for standard width wheelchairs. Porthmadog, Blaenau Ffestiniog, Caernarfon and Rhyd Ddu Stations have ramped access routes and specially adapted toilet facilities (for further details please see our access statement). To enable us to help you make the most of your visit, please let us know when you are coming by telephoning 01766 516024. NOTE: Guide / Assistance dogs travel free. Certain ticket types are now available to book online. Please visit our Online Ticketing page for further information. Dogs and Bicycles are welcome. A flat fare of £3.00 per animal or bicycle applies. We regret, however, that dogs cannot be accommodated in the first-class portions of our trains. Please also note that dogs are not allowed on carriage seats. Limited accommodation for bicycles is available on some Ffestiniog Railway trains. Bicycles can be carried on most Welsh Highland trains. Please book before travelling - details from 01766 516024. Confused by all the options? - Here are a selection of planned journeys from our principal stations for you to try.